In Slovakia, we sure do eat some strange soups! 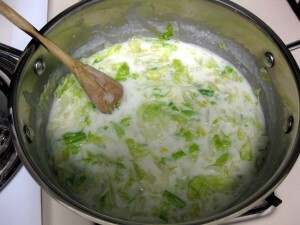 There is the sauerkraut soup (kapustnica), garlic soup, and the topic of this recipe, soup made out of pretty much nothing but iceberg lettuce. Still, this is one of my favorite Slovak dishes, although I do admit it is bit of an acquired taste. You should definitely try it. Start by preparing "zápražka" by browning 30g of flour (múka) on butter (maslo). Add 0.5L of water (voda) and bring to boil. 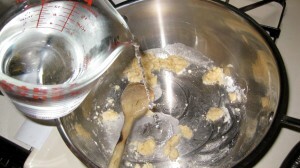 Use a wooden spoon to break up any remaining flour chunks. 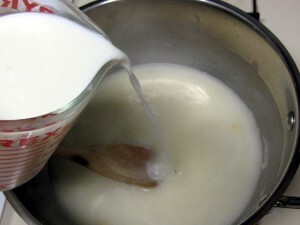 Dissolve the remaining flour in 0.5L of milk (mlieko). Add to the pot and let everything boil. 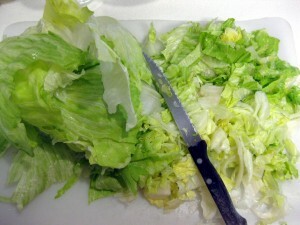 Chop up one head of iceberg lettuce (šalát) and add to the soup. Use only the outer, green leafy parts. Next season the soup with salt (sol), sugar (cukor) and vinegar (ocot). I used about one tablespoon of salt, 2 tablespoons of sugar and 5 tablespoons of vinegar. Boil the soup until the lettuce gets tender (about 5 minutes). 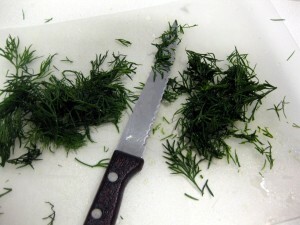 Finally, chop up few stems of dill (kôpor) and add to the finished soup. And there you have it, the lettuce soup. Serve with a slice of hearty bread. On Twitter or Facebook? Connect with us. Prefer email? Subscribe to the newsletter. 56 comments - What do you think? This is great looking salat soup! Very – very good looking soup – better than mine. this is one dish that there is definitely nothing similar to in the US. I think in general I have not had a soup that had such a strong dill flavor. It was pretty good though. i wonder if you could maybe add some more things to it like some potatoes or something. If you added anything else to it, it would not be lettuce soup. I ate “dill soup” in Prague at a Czech friend’s home. Delicious. They have dill in a jar in the store there. Use one jar per batch. Yes, Alex you can add anything to this soup. I am from Slovakia and I know some people make it with potatoes or some dumplings. ANOTHER THOUGHT …..ANYTHING ADDED TO THIS ETHNIC DISH WILL SURELY CHANGE THE UNUSUAL SIMPLICITY OF A VERY TASTY SOUP…SURE MY FRIENDS HAVE LITTLE ” REGIONAL ADDITIONS” BUT ( IFEEL THIS A DIFFERENT SOUP THEN) ARE YOU FOLLOWING ME WITH THIS,,,???? I FEEL THE HIDDEN TASTE IS IN THE ” PURITY ” OF THE RECIPE …KEEP IT SIMPLE AND DON’T ADD TOO MANY LAYERS TO THE THING…..I WILL KEEP YOU POSTED ON SOME OF MY RECIPES FROM MY OLDER FRIENDS IN THE BOJNICE BOBOT/LEHATO AREA.. GREAT SITE JOE P.S HOW ABOUT SVILKA??? A BEET RELISH??? ANY THOUGHTS ON THIS ONE…. I am glad you liked it! It’s one of my favorites. Next you should try making kapustnica. It’s our traditional Christmas dish. OK, here is a question. Does anybody have a good recipe na drzkovu polievku? My grandmother made a dish of bread dough with a filling of cheese and mashed potatos.This was then rolled out in a big round,baked in the oven,and brushed with browned butter.Can anyone tell me what this is called? This is similar to the oma’c~ka my mother made with spinach (instead of lettuce). I also make a similar soup from my mother–for which I really don’t use a recipe–that is made with the za’praz~ka base (which includes the addition of a few slices of lean bacon cut into small pieces), chicken broth (instead of water), fresh green beans, a dash of vinegar, a little chopped dill, and a good dollop of sour cream in the nearly finished soup, plus another on top of the soup as it is served. I thought you might enjoy trying this out; it was a special treat many years ago for our family when we could pick the beans from the vegetable garden in our backyard and bring them straight to the soup pot. Your recipes are wonderful, and I hope there is a Slovak cookbook in your future! My gramma used to make this and passed the recipe to me. I never knew it was an actual “dish” until now! Hi Micki, thanks for stopping by. Yup, the lettuce soup is a really popular dish in Slovakia. By the way, how did you stumble upon this recipe? Try to have some hard-boiled egg with this soup. Gives it beautiful combination on green and yellow and tastes really nice ! What??? This is one of my favorites! 🙂 But yes, it is definitely an acquired taste. As far as I know, it’s made exclusively with iceberg lettuce. But feel free to experiment and let me know hot it turns out. I was raised on this soup by my babka and have to say she never used any other lettuce but butter lettuce, also called bibb lettuce. you can get it in any grocery store specially wrapped in a hydroponic container (this way it lasts forever). Also we don’t add dill because the bibb lettuce has its own specific taste and the dill would kill it. Thank you very much! I have never heard of this lettuce. I am definitely gonna look for it next time I go shopping. Thank you for your tip. I think it is also called Boston Lettuce, so if not seeing Bibb, look for Boston lettuce. It is the one, mostly used in Slovakia, not hard leaves, but very soft and buttery. More flavor than iceberg, or romaine. My family in Slovakia prepares it in sour-sweet marinade, made of sugar, vinegar, water and a pinch of salt. same here :)) just got it for the same sweet and sour salad at Henry’s (if any of you live in SoCal you know what store it is). the salad goes perfect with mashed potatoes and snitzle….and the leftover goes for the salad soup. My mother used the leaf lettuce from our garden. My Slovak grandma made it with the same lettuce. I think it was simpson seed lettuce. It was amazing!! Both my grandmas, my mother, and myriad aunts all made this soup. In fact, they also made pumpkin soup, stringbean soup, potato soup, cabbage soup (not kapustnica) – all of them started by making a roux. There were weekly variations. The quality of the bread served with any good Slovak soup is extremely important. Ideally, it is also home made, a large round loaf with a thick, crisp crust that you tear rather than slice. Definitely agree with you on the bread part. That’s why I got into baking my own; it just tastes so much better than the store bought stuff. And funny thing you mention “roux”. I only learned recently that this is what zápražka is called in English (French really, I guess). For the longest time I had no idea how to translate the word. I was reading through some cookbook, and came upon a recipe which called for making roux. The description sounded exactly like what is done in Slovak cooking. many years ago, my gramma taught me to cook some wonderful hungarian meals. of course our favorite has always been cabbage rolls but my sons love lettuce soup. the difference is, we make the white sauce and some water and TONS OF SOUR CREAM. if i have bacon i also put that in the soup. now all of my grandchildren like it also. my aunt made this soup years ago but add polish sausage, bacon pieces, and cubed potatoes. I couldn’t get enough of this soup. she passed the reciepy to my father who use to make it really good, however he started taking alot of short cuts and totally ruined the flavor. My father has since passed away and no one else in the family knew how to make this soup. I have been looking for this reciepy for years. I actually stumbled on it totally accidentally. I am so excited to have finally found it and can’t wait to make it. thank you sooo much for sharing it, i’ll let you know how it comes out and what my family thinks of it. can anyone tell me the history of this soup please?? its my homework, lol, thanks!! The bread dough and the mashed potatoes and/or cheese sounds like pagac(pagach). My grandmother used to make the bread dough and fill it with items other than potatoes and cheese. My mom’s favorite was apple filling. She would have a mound of a sweet bread dough, punch a hole in the middle, put a filling in, pull up the sides, and carefully roll it out into a round shape and bake. I think you posted it in a wrong thread? My mom made a variation of this soup using buttermilk instead of sweet milk and then we ate it with boiled potatoes with smothered in browned butter. She didn’t use dill although that was a popular seasoning in our family. I haven’t had it in years but loved it as a child (many years ago). I’m planning to make it in the near future. Would love to have your recipe for lettuce soup made with buttermilk and served with browned potatoes. My Slovak grandmother made this version for me growing up and I miss it so much. I would be very thankful to you if you would share it with me! Thanks in advance. I’m so happy to have my Baba’s recipes again. She was born in Myjava. Just one question. We always called these soups omachkas. Is this a regional thing? Thanks Al. About your question, omáčka (oh-MAACH-ka) means sauce. Soup is polievka in Slovak. looks nasty? Oh well, but it’s good! My SO of American origin always says “yuk, them halusky look nasty” so I do not try to tell her otherwise as there is more or all left for me. Don’t judge all food by its look, we all have a different view what looks good or bad. In the end it’s taste in food that matters. Love this website! 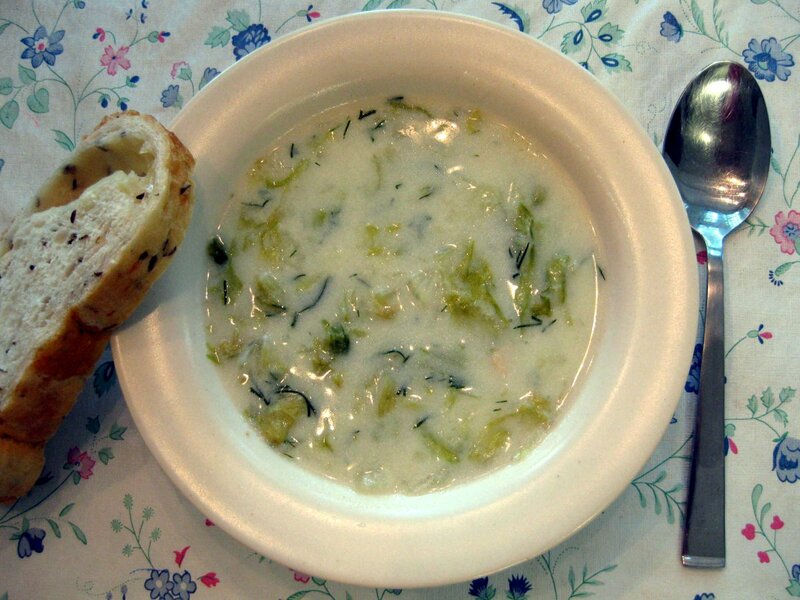 My grandmother regularly made some sort of creamed soup as well – lettuce, string bean, mushroom. My favorite is the mushroom, and I continue on with her recipe. Reading through this site really brought me back to my roots. Thank you! I’m Polish and my mom makes this soup, too! Smart slavs think alike! It’s a sublte soup, so we prefer flat leaf parsely to the dill, at least for this soup. She also uses diced pork meat in addition to the bacon bits and potatoes. Just warms the heart thinking of this and all the delicious soups she makes! My grandmother made a soup made of leaf lettuce, vinegar, and a cornmeal base. If anyone knows the proportions in that variation I would be overjoyed! I collect Slovak heritage cookbooks and haven’t found anything close. My family is from Zavadka nad Hronom. dose this sound like anything your familiar with, or can you throw all this into the lettuce soup? I have an abundance of lettuce, and I’m trying to make it like my Slovak mom did. She browned bacon and onions and garden lettuce. She finished the soup with buttermilk. Does anyone else have a lettuce soup using buttermilk? 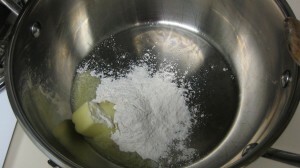 See my comment…Buttermilk instead of regular Milk and bacon!I USED EQUAL AMTS OF WATER TO BUTTERMILK (1/2 GALLON BUTTERMILK & SAME AMOUNT OF WATER) 1 STICK BUTTER & 8 TBS OF FLOUR= THE ROUX…FOLLOW RECIPE DIRECTIONS. HOPE THIS HELPS…IT MAKES A GOOD SIZE POT OF SOUP! This is a great Soup…My Mother would make it with our neighbors Garden Leaf-Lettuce. Add 6 slices pre-cooked Bacon (degrease on Paper towels) & breakup bacon into small pieces and add to water before it boils. 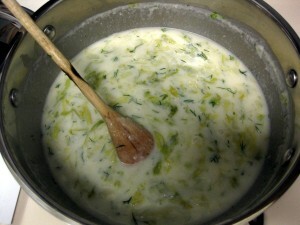 Also, Buttermilk was used and it makes a delicious Slovak Soup…vinegar & sugar is optional! Add a lg amount of lettue last and it wilts down. Enjoy…salt + pepper also!! lol … wonder if she was neighbor to either side of my family … my Mom & Dad had to walk some distance through the woods to get to grade school in Myjava when they were kids. Bbabička and Dedko had a veggie farm in Canada and of course lettuce soup was made from the fresh picked lettuce. Never did any Slovak dishes on my own so this will be the first ! TYVM for including the recipe on your site Lubos! Around city Myjava is hilly country. Settlements are surrounded by meadows and woods. City Myjava was called the metropolis under a straw. I just love this soup – I think I’ve made it four times now. I serve it with diced HB eggs on top, browned pieces of smoked sausage, and sour cream on the side. What a beautiful dish this is. I think the recipe originally caught my eye because I’m Hungarian and this sounded like something my mother would make. Of course sour cream would be present on the table! I had this soup in Slovakia – with chopped hard boiled eggs in it. Very good! It’s been along time since I made lettuce soup but when I do I use Sapraska or flour gravy it’s delicus instead of ice rug lettuce I use Leaf luttuce it makes e tender taste and less cooking time. Try it it’s delicus. Wishing you all happy holidays and all the best in 2018. Hopefully 2017 was a good year for you all. Welcome to SlovakCooking.com, website dedicated to traditional Slovak recipes and home-made cooking of our grandparents. Don't forget to subscribe to the newsletter and follow us on Twitter and Facebook. asiantvshow on What is Slovak Food? kshowslive on What is Slovak Food? Halik on What is Slovak Food? zeetvdrama on What is Slovak Food? tfctvlive on What is Slovak Food? ofwpinoytvako on What is Slovak Food? pinoyshowstv on What is Slovak Food?